Guatemala dealt a lackluster United States a devastating 2-0 defeat in a 2018 World Cup qualifier on Friday in Guatemala City. With goals in the first 15 minutes from Rafael Morales and Carlos Ruiz and an outstanding performance from goalkeeper Paulo Motta, Guatemala earned their first ever World Cup qualifying victory over the USA and leapfrogged over Jurgen Klinsmann's men into second place in Group C in the fourth round of qualifying in North and Central America (CONCACAF). Klinsmann had been bullish heading into the match -- the first of two in five days against Guatemala -- saying he was hoping for maximum points so the United States could secure their spot in the final "Hexagonal" phase of qualifying before turning their attention to the Copa America Centenario. Instead the Americans will be in damage control mode when they host Guatemala in Columbus, Ohio, on Tuesday. Guatemala got off to a dream start when Morales rose for a corner and nodded it off the back of Mix Diskerud and past US goalkeeper Tim Howard in the seventh minute. Ruiz made it 2-0 in the 15th when a long goal kick from Motta rolled untouched past the US defence, Ruiz racing onto it and beating Howard. 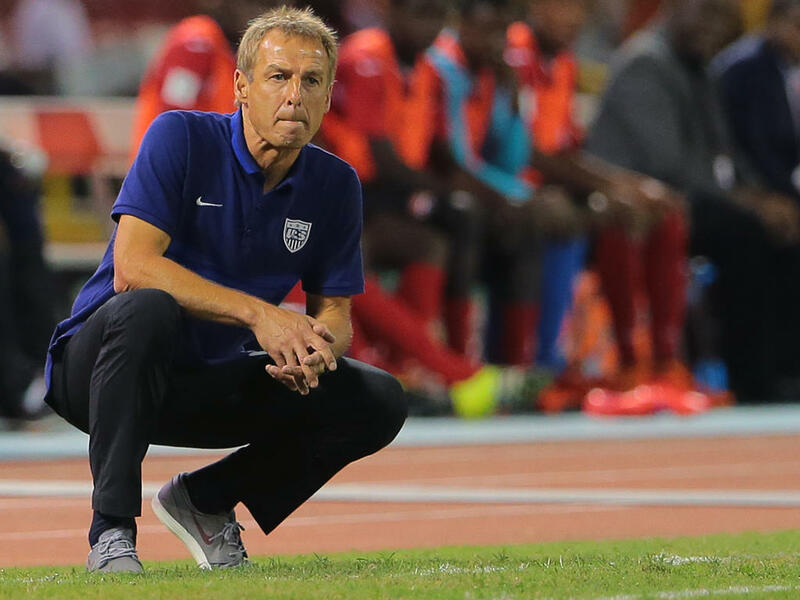 "For us it's obviously disappointing," said Klinsmann, who praised the play of Guatemala but said the United States made "too many mistakes". "On the international level you cannot make the mistakes that led into the two goals, you simply cannot allow that," he said, noting that the near post was left unguarded on the corner that produced Morales' goal. "The second goal was a sequence of mistakes," said Klinsmann, as a succession of US players failed to pick up the ball leading to Ruiz's chance. "That's what Carlos Ruiz is famous for, he's sniffing around, that's what he's done his whole career," Klinsmann said. "The pitch was fast," Ruiz said. "So one bounce, I think Omar (Gonzalez) didn't see the bounce. I ran behind him and I was one-on-one with Tim Howard." After struggling throughout the first half to create clear chances, the visitors looked more dangerous early in the second. Motta, however, made half a dozen solid saves to keep the US at bay, including stopping an 81st-minute attempt by substitute Jozy Altidore. "We said at halftime let's turn this thing around," Klinsmann said. "There were enough chances to win the game, but we didn't put it in." The victory gave Guatemala six points from three matches, one behind Group C leaders Trinidad and Tobago, who battled back from a 1-0 halftime deficit for a 3-2 victory at lowly St. Vincent and the Grenadines. Levi Garcia's two goals for Trinidad included the game-winner in the 82nd minute. The United States' four points put them in third, ahead only of St. Vincent and the Grenadines with none. In Vancouver, Mexico defeated Canada 3-0 to post their third win in as many matches. The dominant victory included goals from Javier "Chicharito" Hernandez, Hirving Lozano and Jesus Corona. Hernandez headed in the opener in the 32nd minute. Canadian keeper Milan Borjan came up with a number of saves to keep the hosts in the contest before Lozano delivered his first international goal in the 40th, taking the ball through Canada's half and slotting home a shot. Corona capped the scoring in the 72nd. Mexico lead Group A with nine points, five more than second-placed Canada going into their next clash on Tuesday. El Salvador are third in the group on two points after a 2-2 draw at home to Honduras. In Kingston, Johnny Acosta grabbed the equalizer in the 68th minute for Costa Rica in a 1-1 draw against Jamaica that kept the Ticos atop Group B.
Je-Vaughn Watson had put the Reggae Boyz ahead with a diving header past Keylor Navas in the 16th minute. Acosta equalized after Jamaican goalkeeper Andre Blake was unable to control a shot from Cristian Bolanos. Costa Rica lead the group with seven points, three more than Jamaica and Panama, who were held to a goalless draw in Port-au Prince by Haiti. The top two teams from each of the three groups advance to the final six-nation round of qualifying.